Meathead Movers is here to take care of the heavy lifting for you on your move to Compton. Our clean-cut student-athlete Compton movers are ready to get you safely settled into your new home. 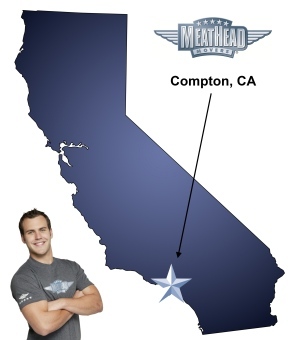 At Meathead Movers, we are proud to be your Compton movers of choice. Generally considered the geographic hub of Los Angeles County, the city is one of the oldest cities in the county. Despite being one of the oldest cities in the area, individuals and families moving to Compton benefit from the area’s youthful vibe and cultural diversity. Compton is also well-known in pop culture as the home of many famous rappers and African-American athletes. One of the city’s most notable features, a beautiful monument dedicated to Martin Luther King Jr., stands proudly right outside the superior court house and also serves as the city’s logo. Other notable sites include the world-famous Watts Towers, located just a few miles from the city, and the historical Heritage House built in 1889. A great benefit of living in the city is that all of Los Angeles County is accessible through the Metro Blue Line which intersects with many major area freeways. The cultural diversity of the area allows residents to enjoy a variety of parades, festivals and special events every year. The Latino influence in the area is seen in a new outcropping of restaurants, bakeries, and shopping plazas catering to Spanish speakers. For serious shoppers, the Gateway Towne Center provides comprehensive shopping opportunities in a relaxed, outdoor setting. The city is a growing area of culture and diversity, and we at Meathead Movers are here to help you with your move to, from, or around Compton. At Meathead, we have more than 15 years of experience as Compton movers. We are prepared to execute long-distance, commercial, and local moves. With the help of our proprietary software, our friendly and professional office staff will coordinate every phase of your move. In addition, our free moving concierge service is designed to give you referrals to trusted service providers in your new area. If you need help prior to your move, our Princess Packers can take care of boxing all your possessions and can be trusted to take extra care with your fragile items. All our movers are drug-free, clean-cut student athletes who jog when they aren’t carrying your possessions to save you valuable time and money. We pride ourselves on offering movers who go above and beyond to take great care of your possessions and provide the most excellent customer service possible. At Meathead, we understand that the moving process can be stressful and we want to ensure your move to Compton is as pleasant an experience as possible. With a 100% satisfaction guarantee, you have nothing to lose! Give us a call today to learn more about what the Meathead Difference really means and ask our Compton movers for your no-obligation, no-cost move quote. Moving to Compton? Here are some helpful resources. Very nice people, prompt and thorough!